Ana (which translates to nosoul) should never have been born into a world of 100 million souls that have been reincarnated over and over again for centuries. Make that 99 million now that Ana was born and a reincarnated soul didn't come back. To say the least, her birth wasn't taken well. Ana is taken from Heart to live with her "snake-hearted" mother far away, ostracized from the others. At 18, she is ready to go out on her own and make her way to Heart to find out who she is and why she was born. Her journey starts out more than rough and she ends up being rescued by a boy named Sam. A boy who doesn't ridicule her for being a nosoul. In fact, he sees her as a newsoul and vows to help her find out what/who she is. The concept of this book is totally original and captivating. Just the thought of a new soul being born into a world where everyone has been around for thousands of years is interesting enough. Throw in a truly wretched "mother" and "boy" who is a zillion years old and willing to give this girl a chance at living the life she was born into, puts this story into the awesome category. The cover....icing on the cake. The plot alone is not the only thing new and inventive. Character names, creatures, settings, language - all are creative and draw you into the fantasy world of Range. Ana is one of the strongest and bravest characters I have read about. She reminds me of Katsa in Graceling. Ana is independent, not by choice, and has done what it takes to survive. Including, teaching herself how to read. When Sam rescues Ana from drowning in a lake while escaping a Sylph, she has a hard time accepting assistance. Eventually, she learns to trust her rescuer and although she fights her feelings, she finds her first friend. Sam is patience, understanding, and sympathetic - something Ana has never experienced from another. Watching their relationship teeter and blossom (and repeat) was entertaining and I was pulling for them the whole time. Often in a first-person novel, we don't get to know the other characters as well. That is not the case in Incarnate. For me, Sam had a starring role as well. His story is mesmerizing and I was just as interested in his past lives and role in Heart as I was Ana's. 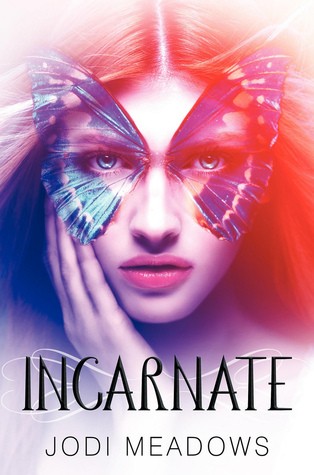 Incarnate is original, fantastical, and you will be hooked! Props to Meadows for giving us not one, but two well-rounded characters with heart and soul. Pun intended! You an find Meadows at her website, Facebook, and Twitter.